Compare discounts for Hotels Motels Resorts in Asheville, North Carolina! Nestled in the Blue Ridge Mountains Asheville, just off the scenic Blue Ridge Parkway, Asheville is home to some major tourist attractions. Downtown Asheville, a National Historic District, boasts over 150 unique shops, 40 restaurants, museums, galleries and fine art theaters. The Asheville Civic Center, home of the Asheville Smoke Hockey Team, hosts a variety of conventions throughout the year. The beautiful Biltmore Estate and Winery, America's largest privately owned home is located just outside of Asheville. Nearby is Historic Biltmore Village with fine shops, galleries and restaurants. Note: Lists are not identical. 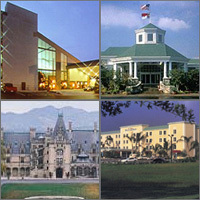 Different sites offer different accommodation options for Asheville. The Renaissance Asheville Hotel offers newly renovated elegant accommodations in downtown Asheville four miles north of the Biltmore estate and adjacent to the Thomas Wolfe memorial. The New DoubleTree Biltmore Hotel is conveniently located one block to the entrance to the world famous Biltmore Estate and within walking distance to Historic Biltmore Village, which contains numerous specialty shops and restaurants. The Ramada Plaza Hotel West is located just off I-40 (Exit 44), minutes from major attractions and shopping. The world famous Biltmore Estate is just six miles, the Biltmore Square Mall and the Blue Ridge Parkway are just three miles and the beautiful downtown area is just five miles. Guests to the Best Western Asheville Biltmore East enjoy a cozy feel of a mountain bed and breakfast with all the amenities of a fine three diamond hotel. Each room is spacious, includes a refrigerator, in-room iron and ironing board and hair dryer. The Sleep Inn Biltmore is located close to Biltmore Estate. TGI Fridays and Biltmore Dairy Bar within walking distance. The Days Inn Asheville Mall offers the best complementary hot breakfast buffet in Asheville. The Quality Inn Biltmore East is located within easy access off I-40 at Exit 55 and is only 5 miles from Biltmore Estate and 1 mile from the Blue Ridge Parkway. The Days Inn Airport is located in the beautiful Mountains of North Carolina, conveniently on Interstate Highway 26 and only minutes away from Interstate Highway 40. The Super 8 Motel Asheville East is located off Interstate 40, five miles from downtown Asheville. The Days Inn Patton Avenue is located in beautiful historic fast growing downtown Asheville with panoramic mountain view with access to all major highways and attractions. At the Holiday Inn, located near Asheville Airport, you'll find exceptional value with comfortable accommodations, a convenient location and affordable rates. Baymont Inn Asheville strives to make you feel right at home with a clean room cared for by a friendly staff.